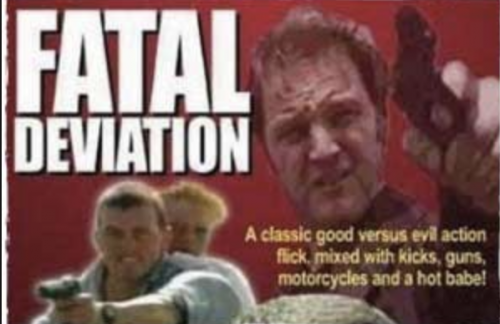 For this months Shaw Cinema Sessions we’re breaking out our favourite film from the depths of Trim, a pivotal moment in Irish Cinematic History as the first Irish full-length martial arts film – Fatal Deviation. The cult classic was made in 1998 featuring real-life martial arts enthusiast James Bennett and Mikey Graham – yer man from Boyzone in a tale of lust, angst, heartache and whopper 360 spin kicks. ‘A young kenpo karate martial artist returns home after ten years in reform school aged 30 on a quest to find out who murdered his father. He is befriended by an old monk and an Irish beauty after getting in a fight in the local Londis. His search takes him to the prestigious Bealtaine Martial Arts Tournament. Together with his past, the good guy is drawn into conflict with the local drug baron and his son, and the conflict makes the young man face his fathers death in a way he could never have imagined. The action is explosive, the fight scenes are dynamic and the story will tug at your heartstrings.’ Including amazing quotes such as “You killed my father! Now I’m going to kill you like I killed your son!” and ‘ENJOY THE SLIDE!’, Fatal Deviation is truly Bloodsport meets Father Ted. The movie went straight to video without a theatrical release. In 2010, Luke McKinney of Cracked.com labeled the film “the worst film ever made.” – What a buzz!